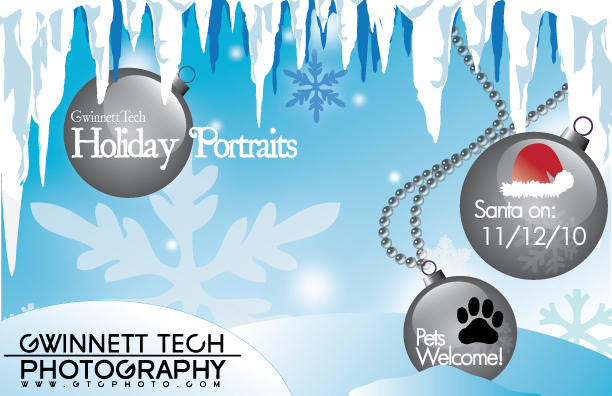 So here is a rough draft of the flyer (so fill in the blanks with words your mind created) I made for Gwinnett Tech's Holiday Portraits. Soon I'll begin working on the blog and I have some really cool ideas for it. Of course everyone saw the layout, but I'm thinking we should all put a downloadable (I think I made that word up) copy on our blogs. Perhaps? Perhaps not? Either way I'm excited to see marketing committee and design committee work together to make this event super popular. I'll post up the finalized one very soon. And to all involved with Holiday Portraits......Godspeed. Erik this looks so good! you are so talented with so many different things!